Not to be confused with Austinite. 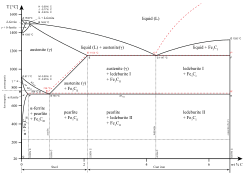 Iron-carbon phase diagram, showing the conditions under which austenite (γ) is stable in carbon steel. From 912 to 1,394 °C (1,674 to 2,541 °F) alpha iron undergoes a phase transition from body-centred cubic (BCC) to the face-centred cubic (FCC) configuration of gamma iron, also called austenite. This is similarly soft and ductile but can dissolve considerably more carbon (as much as 2.03% by mass at 1,146 °C (2,095 °F)). This gamma form of iron is present in the most commonly used type of stainless steel for making hospital and food-service equipment. Austenitization means to heat the iron, iron-based metal, or steel to a temperature at which it changes crystal structure from ferrite to austenite. The more open structure of the austenite is then able to absorb carbon from the iron-carbides in carbon steel. An incomplete initial austenitization can leave undissolved carbides in the matrix. For some iron metals, iron-based metals, and steels, the presence of carbides may occur during the austenitization step. The term commonly used for this is two-phase austenitization. Austempering is a hardening process that is used on iron-based metals to promote better mechanical properties. The metal is heated into the austenite region of the iron-cementite phase diagram and then quenched in a salt bath or other heat extraction medium that is between temperatures of 300–375 °C (572–707 °F). The metal is annealed in this temperature range until the austenite turns to bainite or ausferrite (bainitic ferrite + high-carbon austenite). By changing the temperature for austenitization, the austempering process can yield different and desired microstructures. A higher austenitization temperature can produce a higher carbon content in austenite, whereas a lower temperature produces a more uniform distribution of austempered structure. The carbon content in austenite as a function of austempering time has been established. As austenite cools, the carbon diffuses out of the austenite and forms carbon rich iron-carbide (cementite) and leaves behind carbon poor ferrite. Depending on alloy composition, a layering of ferrite and cementite, called pearlite, may form. If the rate of cooling is very swift, the carbon does not have time enough to diffuse and the alloy may experience a large lattice distortion known as martensitic transformation in which it transforms into martensite, a body centered tetragonal structure (BCT). This is a very important case, as the carbon does not have time to diffuse due to the high cooling rate, which results in carbon being trapped and as a result forms hard martensite. The rate of cooling determines the relative proportions of martensite, ferrite, and cementite, and therefore determines the mechanical properties of the resulting steel, such as hardness and tensile strength. A high cooling rate of thick sections will cause a steep thermal gradient in the material. The outer layers of the heat treated part will cool faster and shrink more, causing it to be under tension and thermal staining. At high cooling rates, the material will transform from austenite to martensite which is much harder and will generate cracks at much lower strains. The volume change (martensite is less dense than austenite) which can generate stresses as well. The difference in strain rates of the inner and outer portion of the part may cause cracks to develop in the outer portion, compelling the use of slower quenching rates to avoid this. By alloying the steel with tungsten, the carbon diffusion is slowed and the transformation to BCT allotrope occurs at lower temperatures, thereby avoiding the cracking. Such a material is said to have its hardenability increased. Tempering following quenching will transform some of the brittle martensite into tempered martensite. If a low-hardenability steel is quenched, a significant amount of austenite will be retained in the microstructure, leaving the steel with internal stresses that leave the product prone to sudden fracture. Heating white cast iron above 727 °C (1,341 °F) causes the formation of austenite in crystals of primary cementite. This austenisation of white iron occurs in primary cementite at the interphase boundary with ferrite. When the grains of austenite form in cementite, they occur as lamellar clusters oriented along the cementite crystal layer surface. Austenite is formed by diffusion of carbon atoms from cementite into ferrite. The addition of certain alloying elements, such as manganese and nickel, can stabilize the austenitic structure, facilitating heat-treatment of low-alloy steels. In the extreme case of austenitic stainless steel, much higher alloy content makes this structure stable even at room temperature. On the other hand, such elements as silicon, molybdenum, and chromium tend to de-stabilize austenite, raising the eutectoid temperature. Austenite is only stable above 910 °C (1,670 °F) in bulk metal form. However, fcc transition metals can be grown on a face-centered cubic (fcc) or diamond cubic. The epitaxial growth of austenite on the diamond (100) face is feasible because of the close lattice match and the symmetry of the diamond (100) face is fcc. More than a monolayer of γ-iron can be grown because the critical thickness for the strained multilayer is greater than a monolayer. The determined critical thickness is in close agreement with theoretical prediction. In many magnetic ferrous alloys, the Curie point, the temperature at which magnetic materials cease to behave magnetically, occurs at nearly the same temperature as the austenite transformation. This behavior is attributed to the paramagnetic nature of austenite, while both martensite and ferrite are strongly ferromagnetic. During heat treating, a blacksmith causes phase changes in the iron-carbon system in order to control the material's mechanical properties, often using the annealing, quenching, and tempering processes. In this context, the color of light, or "blackbody radiation," emitted by the workpiece is an approximate gauge of temperature. Temperature is often gauged by watching the color temperature of the work, with the transition from a deep cherry-red to orange-red (815 °C (1,499 °F) to 871 °C (1,600 °F)) corresponding to the formation of austenite in medium and high-carbon steel. In the visible spectrum, this glow increases in brightness as temperature increases, and when cherry-red the glow is near its lowest intensity and may not be visible in ambient light. Therefore, blacksmiths usually austenize steel in low-light conditions, to help accurately judge the color of the glow. ^ Reed-Hill R, Abbaschian R (1991). Physical Metallurgy Principles (3rd ed.). Boston: PWS-Kent Publishing. ISBN 978-0-534-92173-6. ^ Gove PB, ed. (1963). Webster's Seventh New Collegiate Dictionary. Springfield, Massachusetts, USA: G & C Merriam Company. p. 58. ^ Nichols R (Jul 2001). "Quenching and tempering of welded carbon steel tubulars". ^ Lambers HG, Tschumak S, Maier HJ, Canadinc D (Apr 2009). "Role of Austenitization and Pre-Deformation on the Kinetics of the Isothermal Bainitic Transformation". Metal Mater Trans A. 40 (6): 1355–1366. Bibcode:2009MMTA..tmp...74L. doi:10.1007/s11661-009-9827-z. ^ Kilicli V, Erdogan M (2008). "The Strain-Hardening Behavior of Partially Austenitized and the Austempered Ductile Irons with Dual Matrix Structures". J Mater Eng Perf. 17 (2): 240–9. Bibcode:2008JMEP...17..240K. doi:10.1007/s11665-007-9143-y. ^ a b Batra U, Ray S, Prabhakar SR (2003). "Effect of austenitization on austempering of copper alloyed ductile iron". J Mater Eng Perf. 12 (5): 597–601. doi:10.1361/105994903100277120. ^ Chupatanakul S, Nash P (Aug 2006). "Dilatometric measurement of carbon enrichment in austenite during bainite transformation". J Mater Sci. 41 (15): 4965–9. Bibcode:2006JMatS..41.4965C. doi:10.1007/s10853-006-0127-3. ^ Ashby MF, Hunkin-Jones DR (1986-01-01). Engineering Materials 2: An Introduction to Microstructures, Processing, and Design. ISBN 978-0-080-32532-3. ^ a b c d Ershov VM, Nekrasova LS (Jan 1982). "Transformation of cementite into austenite". Metal Sci Heat Treat. 24 (1): 9–11. Bibcode:1982MSHT...24....9E. doi:10.1007/BF00699307. ^ Alvarenga HD, Van de Putte T, Van Steenberge N, Sietsma J, Terryn H (Apr 2009). "Influence of Carbide Morphology and Microstructure on the Kinetics of Superficial Decarburization of C-Mn Steels". Metal Mater Trans A. 46 (1): 123–133. Bibcode:2015MMTA...46..123A. doi:10.1007/s11661-014-2600-y. ^ a b c Hoff HA, Waytena GL, Glesener JW, Harris VG, Pappas DP (Mar 1995). "Critical thickness of single crystal fcc iron on diamond". Surf Sci. 326 (3): 252–66. Bibcode:1995SurSc.326..252H. doi:10.1016/0039-6028(94)00787-X.